This witty and HILARIOUS book was published in May of 2011. I only got around to reading it this week! I was laughing out loud by page 3. 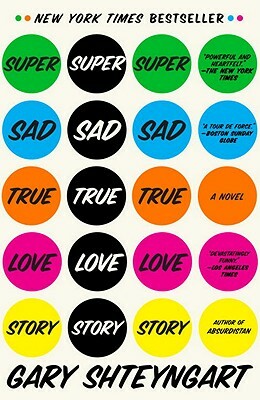 I need to find everything else Shteyngart has written because he is a freaking genius. 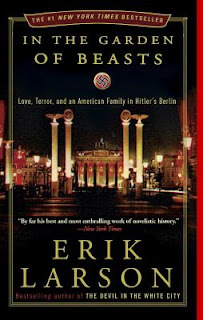 ...and then to nearly weeping as I read Erik Larson's narrative nonfiction book about the American ambassador to Germany during the lead up to WWII. This was a powerful read, especially knowing what we know now. There were people, like Ambassador Dodd, who knew what was coming. Sadly, there were many more people around the world who thought Hitler's reign would be short and uneventful. This book isn't to be missed by anyone who enjoys history. Have you read either of these? Do you plan on it? As always, I'd love to hear what you think! In the Garden of Beasts has been on my TBR list for a while because I've enjoyed several of Larson's books, but it's such a weighty subject. I haven't been in the mood just yet. I have had Larson's book on my radar for some time. I really need to get to it. I am just finishing up a biography of FDR which of course touches on the diplomacy that Dodd was involved with. I read bio of Roosevelt a million years ago. I'm always up for another! Will you be reviewing the one you read? I'll hop over to your site to see! Hey jennifer -The book is Traitor to His Class by HW Brands and I will have a review up in a few weeks. He really became a leader in a most difficult time. However he leveraged his troubles into unprecedented success. He was truly an extraordinary figure. 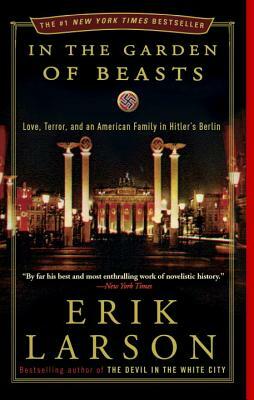 I really enjoyed In The Garden of Beasts. It was a little slow at times, but overall a great retelling of that era in Germany...such a unique perspective! Have you read his other book (Devil In The White City)? I have it on my e-reader but haven't gotten around to it yet.